I normally enjoy reviewing NextGen Gaming slots as they usually have some interesting, varied themes and cool features. The travel-themed Taxi and 1950s-inspired Munchers are two good recent examples, but Pandamania certainly deserves its place up there among NextGen's ones to play. An animal-themed 5 reel, 25 payline slot featuring a giant panda in a zoo (who also acts as the game's Wild), the cartoony graphics and bright colours of Pandamania show that NextGen's sensibilities are firmly on the side of comic. If that isn't your cup of tea then you might want to stay clear of this slot but for those of you that enjoy a bit of humour in your slots then you will be very keen to get involved in this release from the developer. The Wild Panda substitutes for all regular symbols in the game other than the Scatters plus applies a 2x multiplier to each winning line it helps form. There's a nice little bonus feature when an escaped Panda can appear at any time, turning symbols at random into Wilds. However, the free spins hounds are catered for when you land three or more Scattered Sign Scatters anywhere on the reels. 10 free games are awarded, with a 2x multiplier attached to each win. 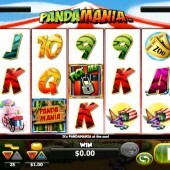 During the spins, you have a better chance of hitting the Panda Escape Bonus, so it can a fruitful feature to trigger. There's a little Instant Win bonus feature to be activated as well, this one triggered by landing three Scattered Pick Me symbols anywhere. Choose one of the triggering symbols to reveal a prize. You can win cash, a 'Pick Again' symbol (which rewards you with two prizes) or a 'Win All' sign which will bag you three prizes. 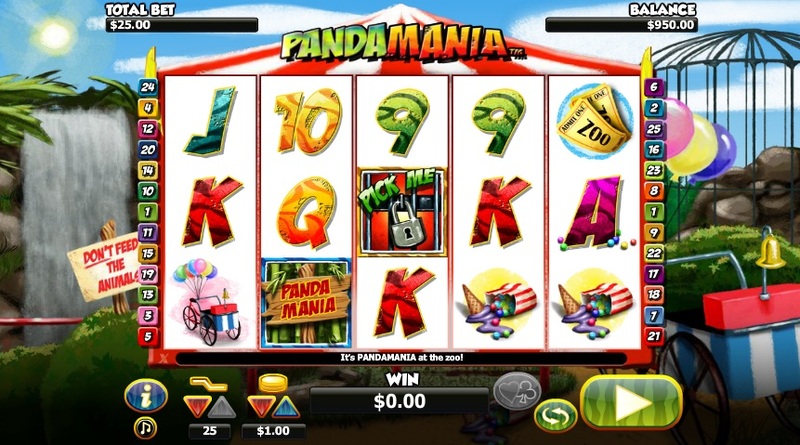 OK, so Pandamania isn't the most in-depth of online slots, but it certainly provides enough simple thrills to keep animal-mad slots players happy for a while. The free spins bonus was pretty regular when I played, and the extra Panda Escape bonuses can be pretty profitable overall. And if a maximum bet of $1,000 per spin doesn't entice the bigger players, then nothing will.